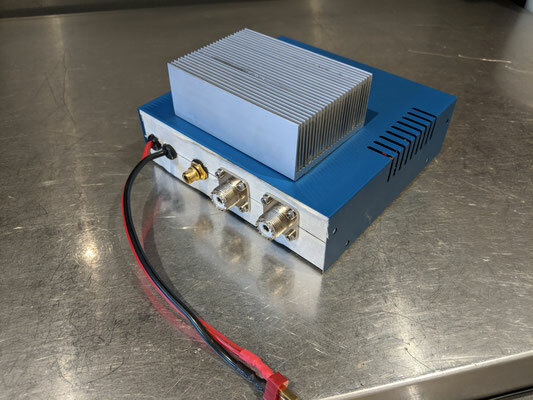 Many QRP rigs are capable of 5 or 10 watts of power, this is often enough for data mode DX, but sometimes you just need more punch to get heard on SSB. 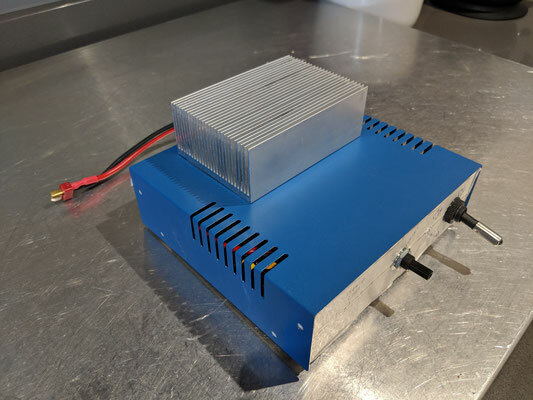 This page will show you how to build your own 100 Watt linear amplifier based on the kits that can be found on the various internet auction sites. 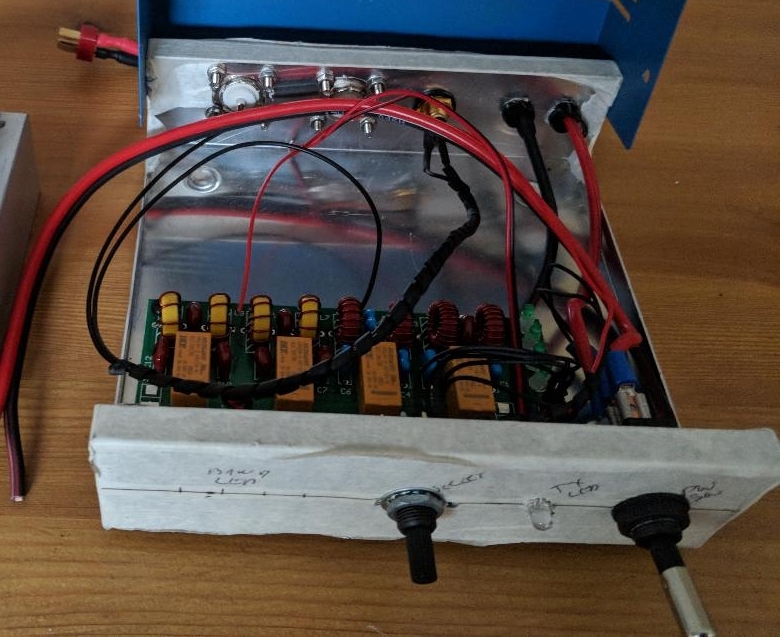 I initially tried making a 45 Watt amplifier kit but could not get this working (or find anybody else that had managed to do this!). 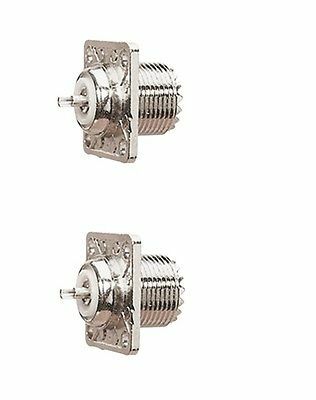 I soon discovered that the 100 Watt amplifier kits are of a much higher standard and appear to work for most people. Therefore this was the kit chosen to support this linear amplifier build project. 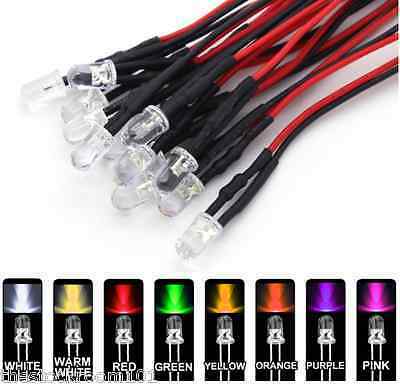 These amplifier kit are relatively cheap and are quite common on the internet. 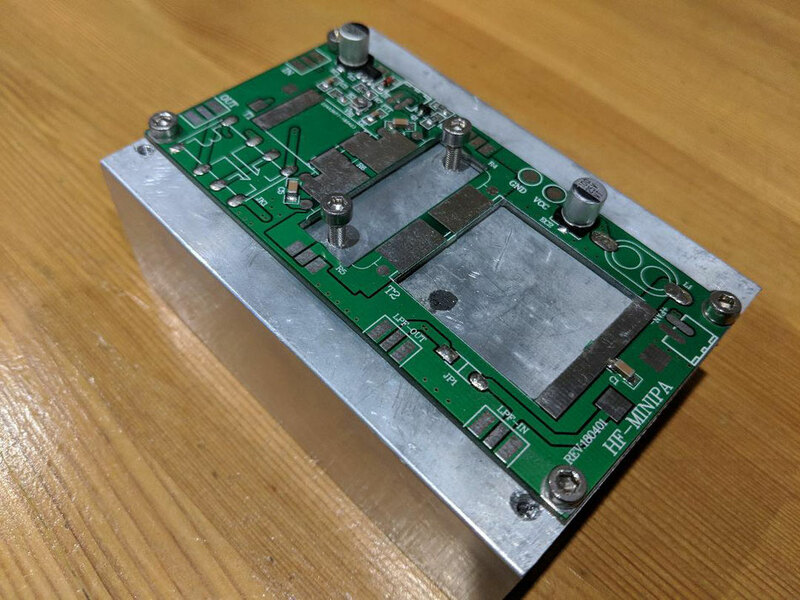 They can't be used as they are, a low pass filter and other items will also be needed to make this a practical piece of radio equipment. This project will utilize a standard 100 Watt linear amplifier kit, a low pass filter, and other ancillary items to make a usable, boxed linear amplifier to suit a 5W QRP rig. Now there are issues with this project, there is no high SWR protection for a start. It's also this is not going to be as refined as a purchased professional kit like the HardRock 50 or the Juma PA 100 kits. But it should be fun to build and certainly a little cheaper. Most of the parts needed to build this amplifier are available from the normal online auction sites. Cost is around $100. 2.5 mm drill bits, M3 taps. Mobile phone with a camera, magnifying glass or great eyesight. 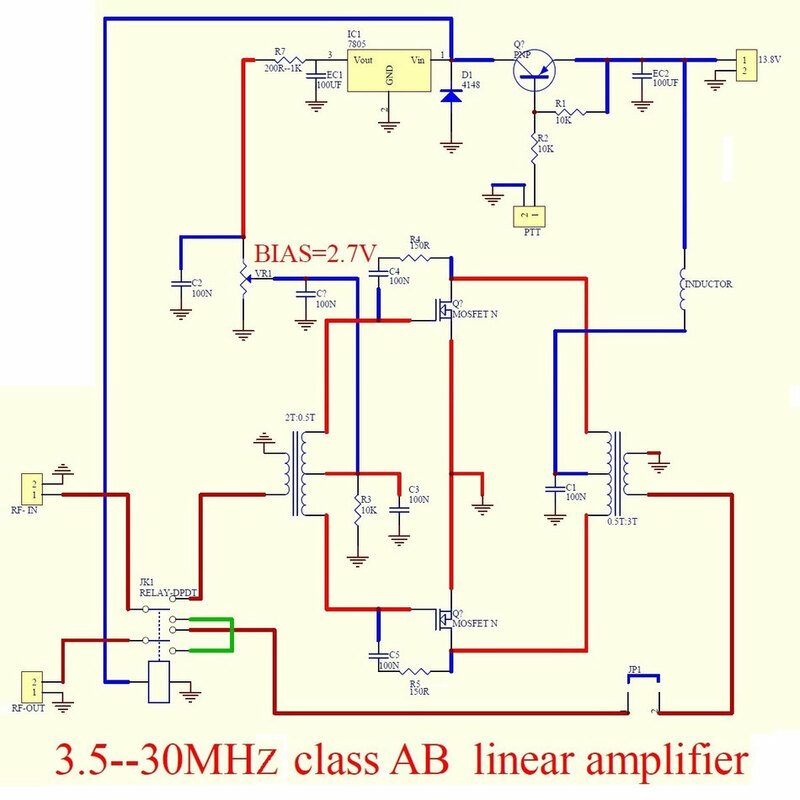 Along with the wanted frequency, the amplifier can also produce other frequencies due to harmonics. These unwanted frequencies can cause out-of-band interference which is obviously undesirable. A low pass filter will attenuate these unwanted frequencies down to a negligible level. An LPF is an essential piece of kit for any HF amplifier. For this project, we have chosen a four-band LPF. A rotary switch is used to select the desired operating band, the selected band is shown via an LED indicator. My kit came with all of the fiddly SMT devices pre-fitted. No instructions were included, but the remaining parts were pretty straightforward to identify. The kit arrived boxed and all the parts appeared new and to a high standard, the mosfet device may have been a reclaimed part (used in the past). 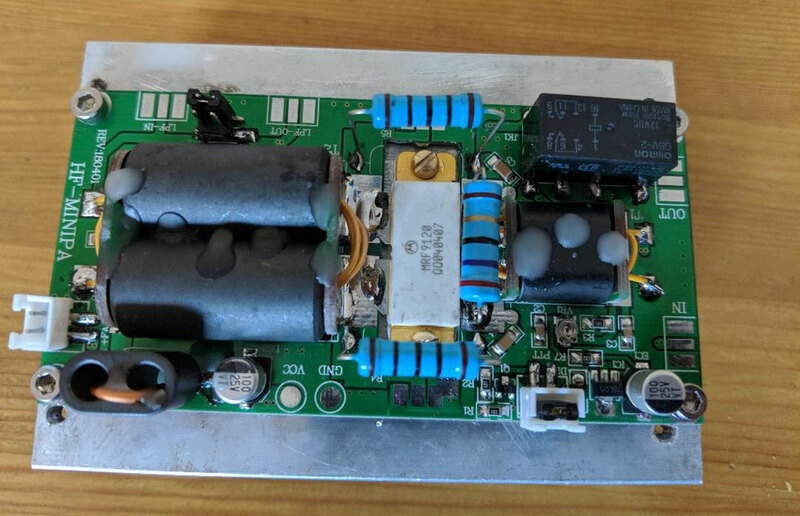 Now, you could save yourself the bother of building the amplifier, for a little bit more costs you can purchase a built and tested amplifier board... However, if you choose the kit version then this will take about an afternoon to build the board up. However, this kit is far easier to build than the 45 Watt kits, so it worth a go if you can. 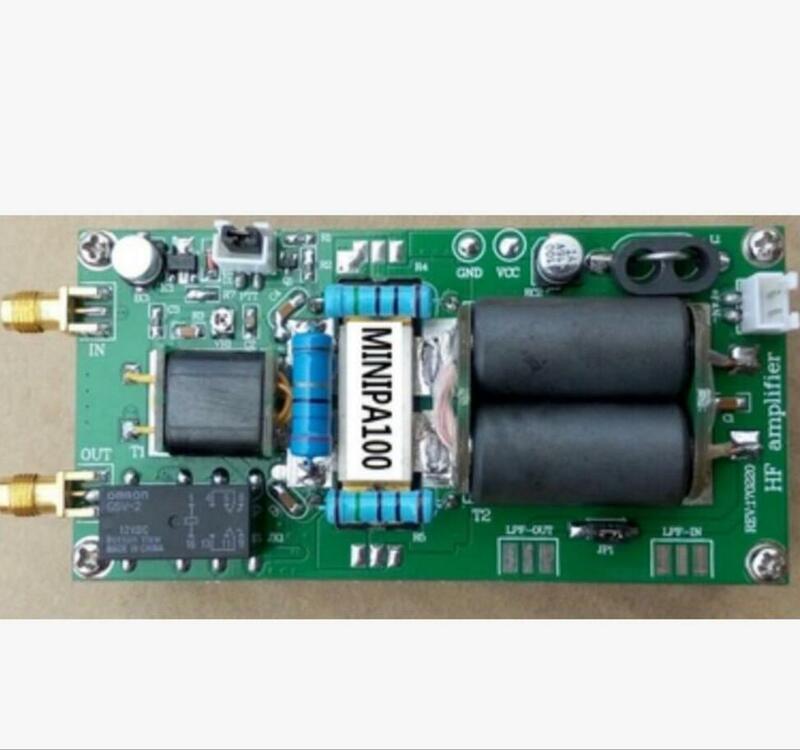 You'll need to refer to the 100 Watt amplifier images when making this kit. This will help identify components and how to make up the indutors etc.. 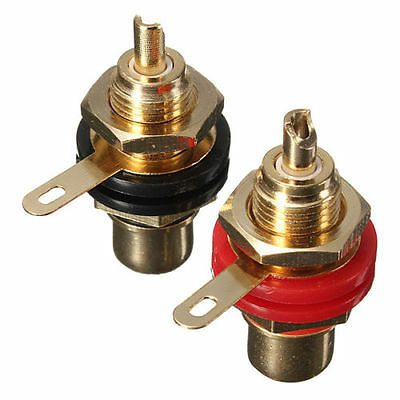 Break out the inductor end plates from the PCB. You may want to file off any burrs. Place to one side. Lay the PCB on the heat sink. Lay the mosfet device on the PCB. Mark the PCB mounting holes with a pen. Mark the Mosfet mouting holes as well. 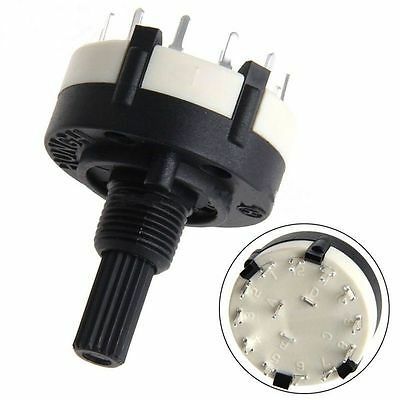 Remove the PCB and Mosfet device, centre punch the holes. Drill the holes with a 2.5 mm drill bit. Tip: Use a clutched drill on a low slip setting. Your drill bit will break if you do not do this. Tap the holes using a M3 tap. Bolt the PCB directly to the heatsink. No spacers. Tip: I layed some thin strips of insulating tape over the insulated tracks. Push the tubes through the ferrite cores. These tubes make the 0.5 turn windings so will be connected at either end. 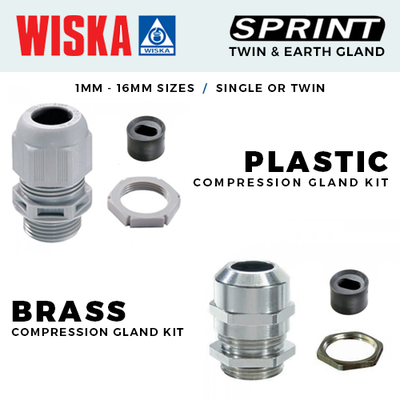 Place these parts on the PCB and tack solder in place. When you happy fully solder in place. Check continuity at this point. Wind the wire through the ferrites and terminate. The small ferrite has two windings, the big ferrite has three turns. 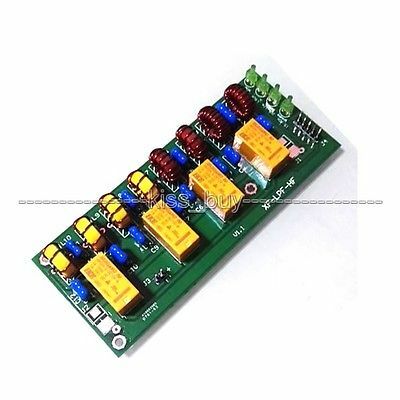 Using a current limited power supply, apply 13.8V to the board. The enclosure was initially covered with masking tape and the required holes marked out. The holes were drilled and de-bured as needed. The hardest job was cutting the aperture for the heat sink. The outline of the heat sink aperture was drilled out, then the rough edges carefully filled to shape. All the component were then fitted to the enclosure ready for wiring. 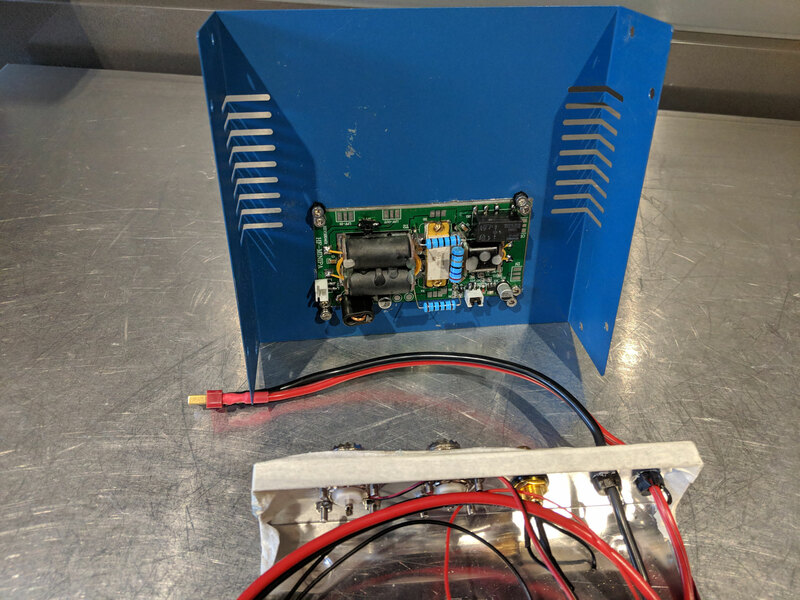 The amplifier board was mounted through the lid of the box. The hole for the amplifier board was cut out by drilling out the basic square shape with multiple holes, then filing to size. Always test for shorts before switching on! It worked.......(for about a minute)! But then it got hot and went pop! When I took it apart I found a small piece of braid lying on the PCB, maybe this was the cause? 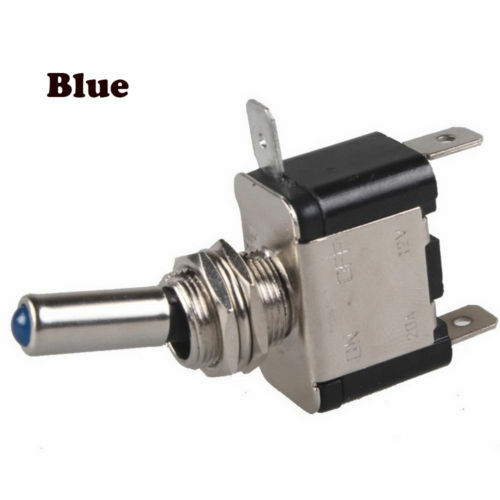 A replacement power transistor was ordered, I replaced the faulty part and tried it again. Connected to my FT817 the amplifier works very well. I was able to control the power via the FT817 output as expected. 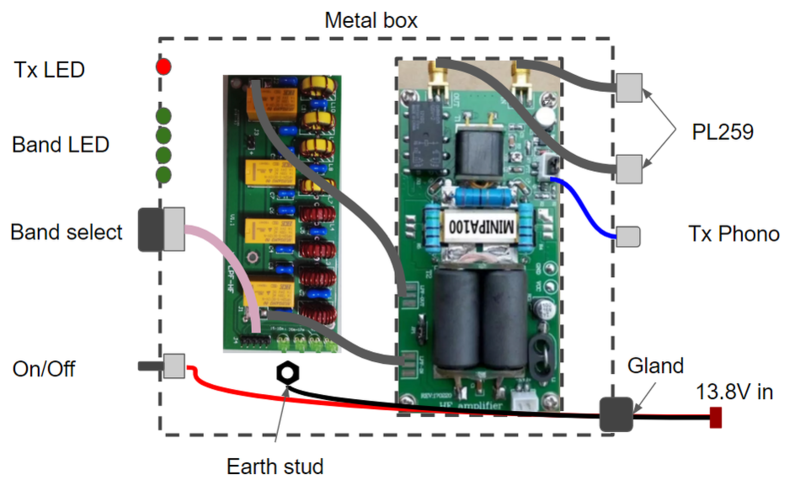 I obtained a maximum power of about 70 Watts from the amplifier which seemed fine for initial testing. I then progressed to live data modes and made a number of contacts. The amplifier would get hot on the higher power settings, but at lower setting, I found this not to be such a problem (maybe a small fan is needed?). I then managed a couple contacts SSB on 20 Metres with no complaints. So the amplifier works and it was great fun to build. However, the lack of SWR protection turned out to be an issue. Although the amplifier can withstand an SWR of 2:1, I still managed to blow up the power transistor a number of times. One issue being the use of automatic antenna tuner, just running through the tuning cycle was enough to make the FET go pop. If I had been more careful then this could have been avoided. 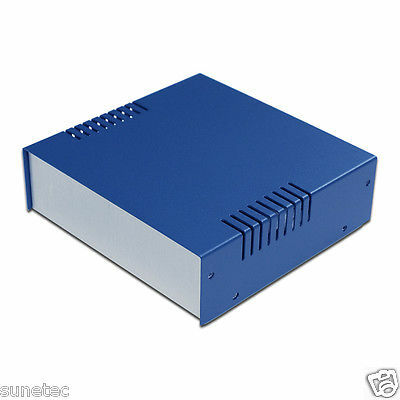 However, this amplifier in its current format will not offer reliability. Next I need to identify a way to incorporate some SWR protection when I work this out I will post this here. I haven't tried these ideas myself yet, but will do at some point in the future. When I'm done I'll let you know!